But, these envelopes are Chinese. Would the ones given by a Japanese person look similar? Would it be okay to use them? They look much fancier than the plain red ones I was planning to make! 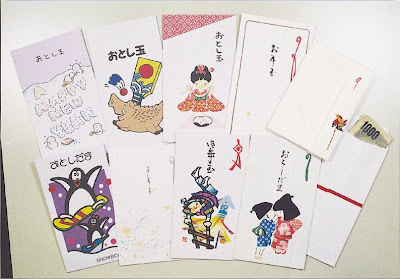 Now I would like to tell you about the special envelopes used in Japan for various purposes. We will look at the Chinese ones further down. 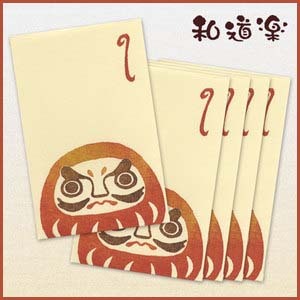 First look at some envelopes with Daruma san. 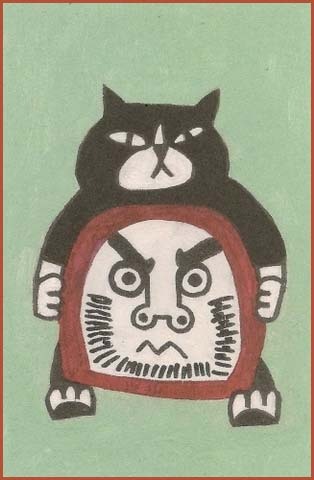 You see Daruma and the auspicious trio of the pine, bamboo and the plum (shoochikubai 松竹梅). The characters wish you a happy new year. 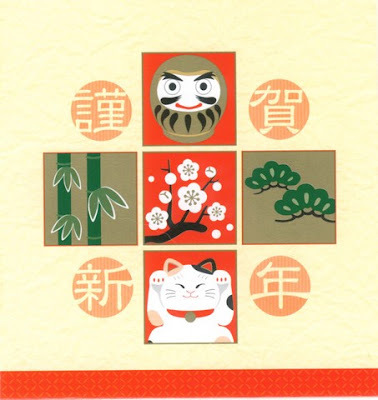 This little envelope also has many symbols for good luck at the beginning of a year. The characters in the middle read: otoshidama, Money for the New Year. 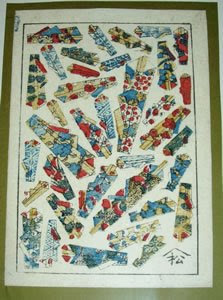 Look at more envelopes here from picture 09 to 16.
is a Japanese traditional custom. It originated from a shrine ritual in which kagami mochi (round rice cakes) are offered to the god of the year (toshi kamisama). After the ritual was over the cakes were given to the people worshipping at the shrine. Some cakes, which are quite large, were then taken home by the master of the house and distributed to his family and household servants. Kagamimochi were modeled on the shape of the Shinto mirror, a round disk of metal that can be seen on or near the shrine altar. This mirror, it is believed, can reflect our spirit. The reading of the Chinese character ''魂 (spirit)'' and ''玉 (round or ball)'' is same: tama. 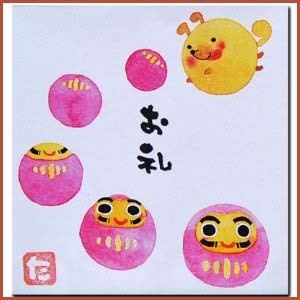 People connected kagamimochi with the idea of tama. So ''god of the year rice cakes'' became reduced to toshidama. The honorific 御 (o) is added to show respect. Over the centuries otoshidama became the name for gifts offered during the New Year period, though they were originally called onenshi or onenga (New Year's Greeting). Today, otoshidama means something else. Traditionally children are given small envelopes by relatives and friends at the start of the New Year in which appropriate amounts of cash are places. As the child gets older the amount grows. There is also an explanation of Otoso, the spiced ricewine drunk on the New Year. 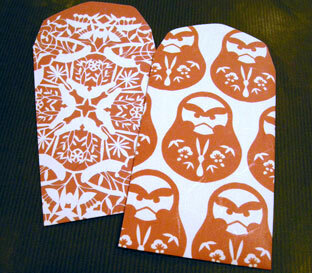 Chinese Patterns for our envelope, a great collection ! Traditionally, the chinese red envelope holds lucky coins often called I ching coins or small precious gifts for gift giving. The red envelope is given to bring good luck, prosperity and happiness to the recipient. Red is the symbol of happiness and ultimate joy, thus the color red is used for all celebrations including weddings and Chinese new year. These beautiful chinese red envelope measures 4" by 2 3/4" and graced with assorted metallic gold embossed designs symbolizing happiness, longevity and good fortune. 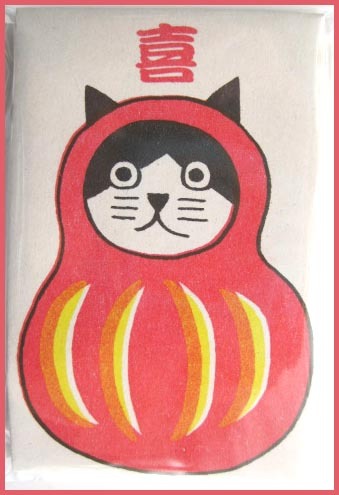 Perfect for holding our chinese lucky coins, chinese charms and even double their use as place cards! This is a link to a side where they show you how to make a special gift envelope for a wedding yourself. The technique is called mizuhiki, using small pieces of reinforced strings. pochibukuro, pochi bukuro ポチ袋（ぽちぶくろ) "little envelope"
This derives from "kore pochi", just a little bit. And envelopes according to the amount of money you put in. is another common name for special envelopes. For the New Year, a thin strip of dried abalone wrapped in folded red and white paper. Because the meat of the abalone tends to strech long, it is a symbol of the long and good human relations. Now even imitations of a noshi made from Japanese paper can be used. The below is a set, where you can cut out one at at time and add it to a paper envelope or a dish of New Year food. Are the red envelopes not used any more? I didn't see any amongst your wonderful examples. If I get the Chinese envelopes, what should I tell my students? I'm trying to be very careful to truly teach Japanese culture and not be sloppy! Would anyone in Japan actually use envelopes that look like the Chinese ones I found, or would I just say that the Japanese use many different kinds and so these are okay to give out? The Japanese do not use the pure red ones. If you want to use them, tell the children they are from China. Red is an auspicious color, in China and Japan. That is one reason why Daruma san is usually red. Kotoshi mo minna genki de iraremasu yoo ni ! at this temple . . .
Are the red envelopes not used any more? I didn't see any amongst your wonderful examples. If I get the Chinese envelopes, what should I tell my students? I'm trying to be very careful to truly teach Japanese culture and not be sloppy! Would anyone in Japan actually use envelopes that look like the Chinese ones I found, or would I just say that the Japanese use many different kinds and so these are okay to give out. Do you understand what I mean? 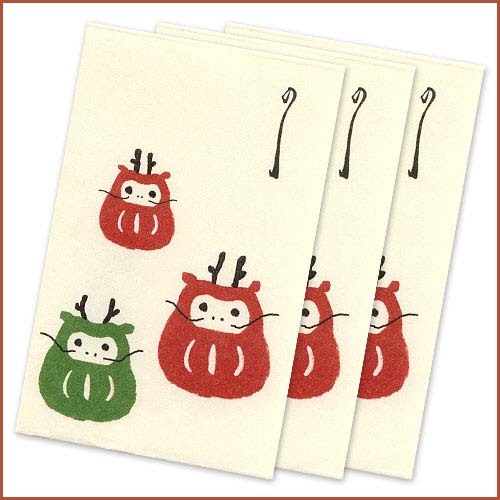 I am happy to say that I was able to order otoshidama envelopes from Japan to give to each of my 300 students! I was even able to include a 5-yen coin in each one. Our parent group gave us the money, and the students were very excited. Thank you again for your help and information! That's a nice blog you have with interesting and well-informed news about the money envelopes. Thank you for all your links too. It really helped me for my research. to a maiko dancer or actor in the Kansai region.